Tanium content published by Moran IT is signed with our organizations private key. By placing our public key within a special directory of your server, you can safely import content Moran IT has signed and published. We have put together a zip file with our public keys and an installer batch script. If you download the zip file to your Tanium server and execute the batch script, as administrator, your infrastructure will be updated to accept signed content from Moran IT. This content is published and shared on the Tanium Community website, and adding our keys keeps the security of content delivered from Moran IT safe. If you would like to setup your own signing keys and process… feel free to ask questions here or contact your TAM and mention this blog. If you’d like to explore the various solutions I’ve built for Tanium, you can browse them here. In any security environment, the first thing that I am asked for is a way to protect the Tanium client from end-user tampering. This is a very common request when it comes to security related software. An innovative TAM at Tanium has built a solution pack which is documented on the community site called “Client Service Hardening”. This solution pack contains a collection of sensors, packages and saved questions related to locking down the Tanium Client service and the file system on Windows endpoints. I would like to explore that solution below. Just like any of the solution packs available from Tanium, to receive a copy of the solution xml, you need to contact your Technical Account Manager and they’d be glad to share it with you. 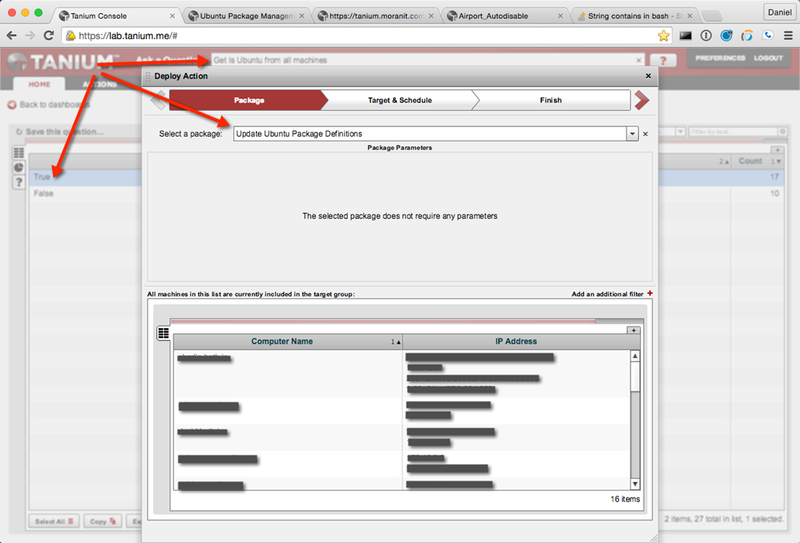 Once you have the ClientServiceHardening.xml, import it by browsing to your Console->Authoring->Import Content. 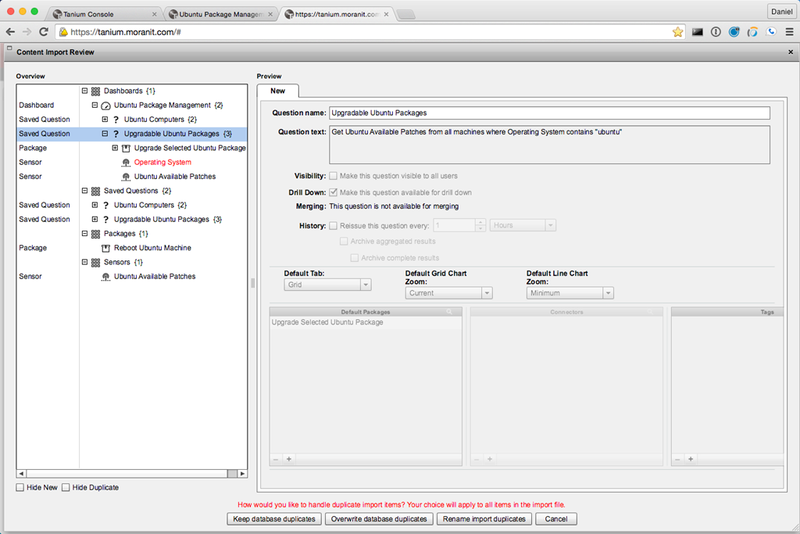 Overwrite any database duplicates, although you should not see any unless you’ve imported an older version of this solution pack like I have. 1. 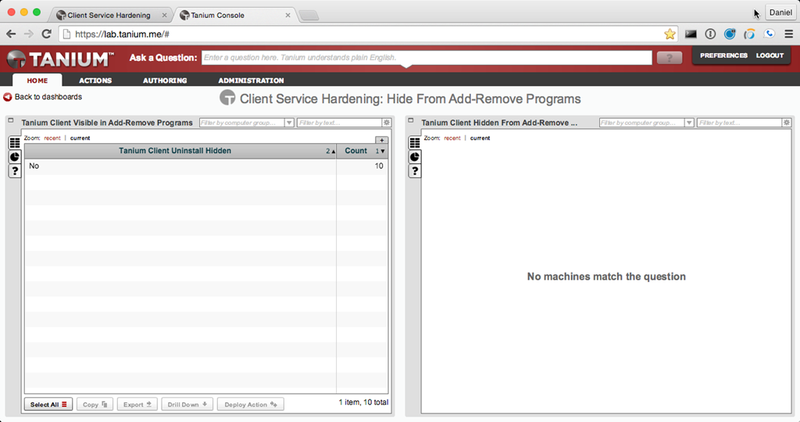 Hiding the Tanium Client from the Add/Remove Programs Control Panel Applet. 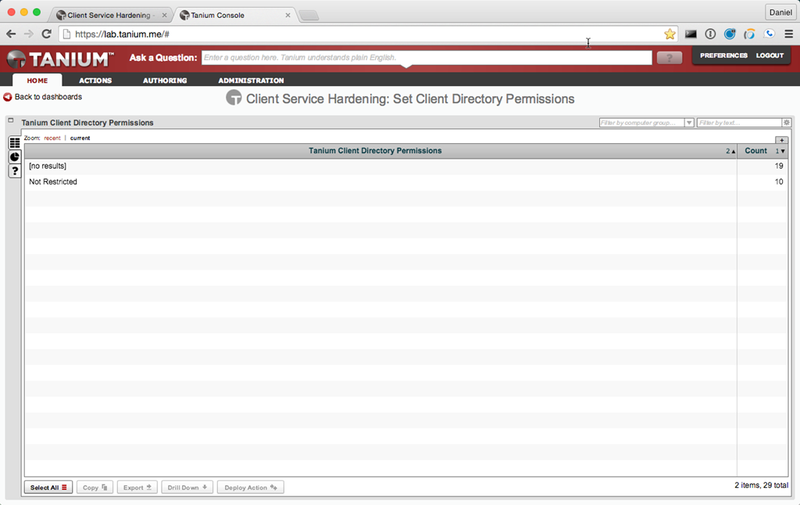 You should implement all three of these in order to fully lock down the Tanium Client Service. Let’s look at and implement each one sequentially. After the questions have completed, right click the “No” answer within the Tanium Client Visible in Add-Remove Programs answer grid. Choose to “Deploy Action” and the Client Service Hardening – Hide Client from Add-Remove Programs should be the default package selected… then step through the action deployment. I’d recommend setting this package to reoccur at least once a day in order to catch systems that might not be online right now. In my infrastructure, I’ve configured the action to reoccur every 6 hours since I have laptops coming on and off throughout the day. I also know this is a Windows-Only action, thus my Action Group is “All Windows Computers”. Note that the action group was configured ahead of time and only has a single computer group configured with “Operating System contains Win”. This action group gives me assurances that this action will only run my windows systems and not my Linux or Mac systems. This action group could have easily been something else like only “Workstations”, “Laptops”, etc. 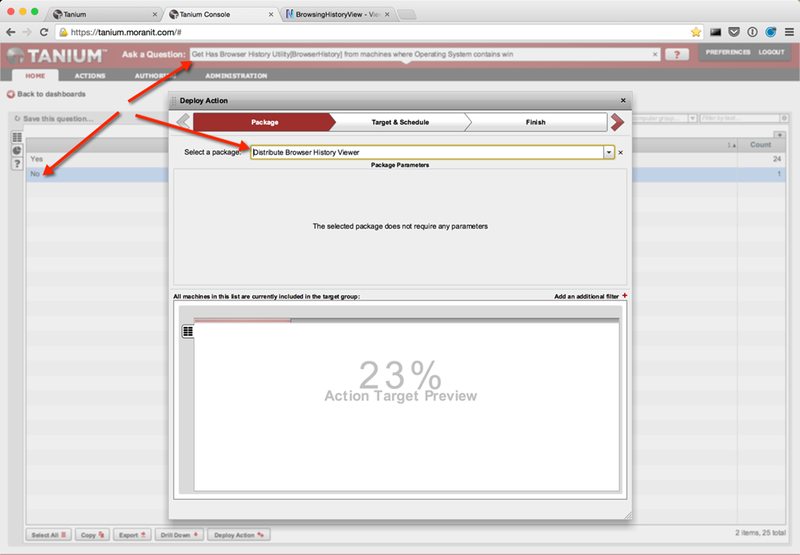 Now as this action runs within my environment, the Tanium Client will disappear from the Add-Remove Programs list. Please note that if an end-user has administrative privileges on an endpoint, it is entirely possible they also have advanced knowledge of ACLs and will be able to reset these permissions in order to stop the service. All of your windows systems should report back “Service Control is set to default permissions” just like in my environment pictured above. 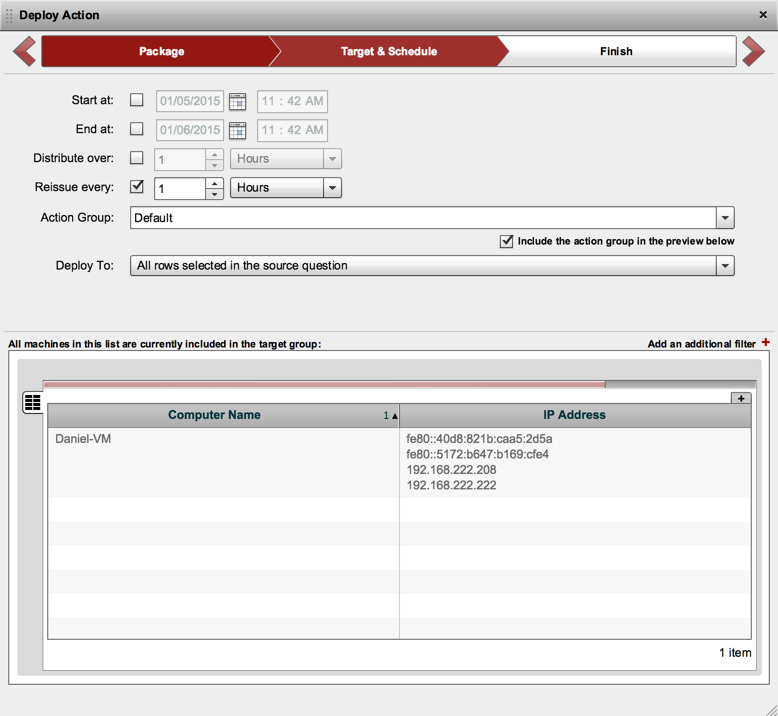 Right click on that answer and “Deploy Action”…The default is Client Service Hardening – Allow Only Local Admins to Control Service, however you could lock the service to allow only the SYSTEM account by selecting the Client Service Hardening – Allow Only Local SYSTEM to Control Service package. I chose to lock it down to SYSTEM since many of my users are configured with local admin privileges and just like before, I will have this scheduled action set to run every 6 hours and only apply to my “All Windows Computers” action group. Lastly we need to lock down the folder permissions of the Tanium Client. 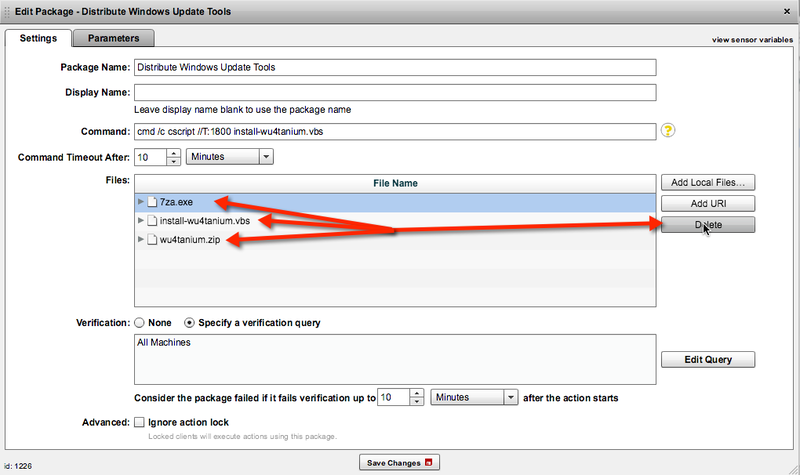 This is the file system level permissions which allow users to browse the “…\Tanium\Tanium Client\” client root directory. 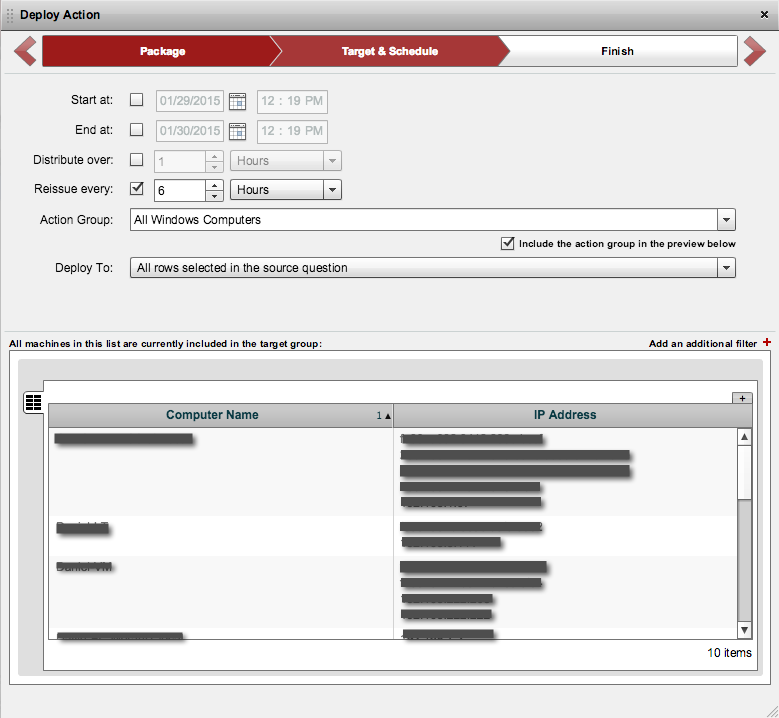 Open the Set Client Directory Permissions dashboard and in the single answer grid, right click on the “Not Restricted” answer to “Deploy Action”. 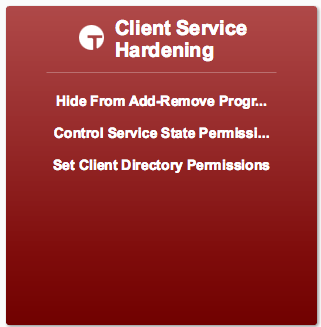 The default action here is Client Service Hardening – Set SYSTEM only permissions on Tanium Client directory. By default, the Program Files directory is locked down to administrators, thus SYSTEM is the only available configuration package. Just like with the previous two actions, I will configure this to run every 6 hours and only on my windows systems. The client hardening techniques covered in this article are very close if not exactly the same security measures that Antivirus and other Vendors take to secure their agents on enterprise endpoints. 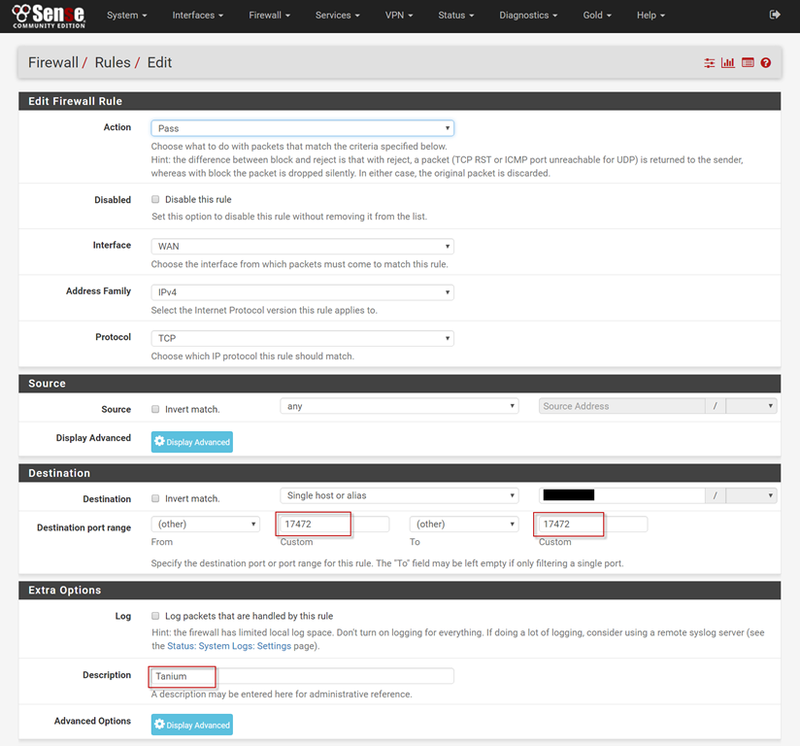 This solution pack also includes packages for resetting the defaults for each of these security configuration settings… so if you want to un-harden the client, it is certainly possible. Let me know if you have any questions about this article… If you have questions about the content, I encourage you to reach out to support@tanium.com and one of their extremely helpful Technical Account Managers would be able to assist. I have more than a dozen Ubuntu servers that perform various jobs. Some of these systems are considered “production” and keeping the installed packages up to date is extremely important. For this article I want to discuss how I am upgrading the installed packages on these systems using the Apt-Get utility and the Tanium platform. I have built a collection of content that was published on the Tanium Community website. 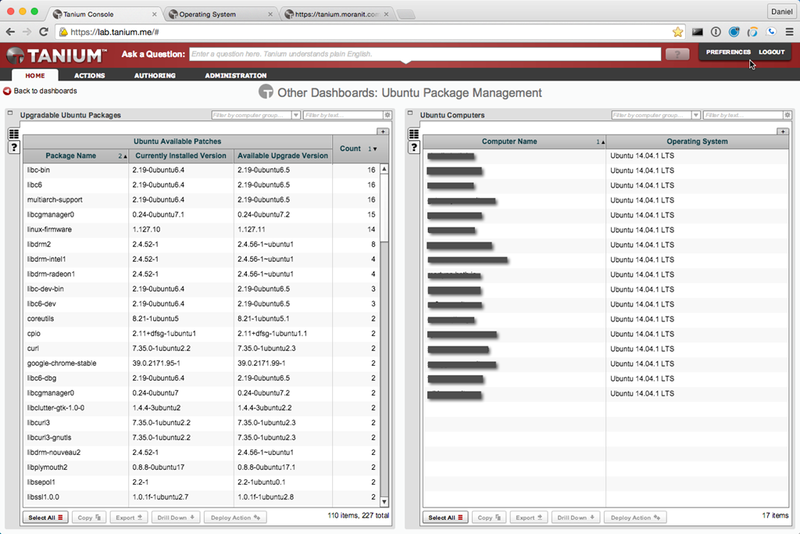 This solution includes multiple sensors, packages and other types of content called Ubuntu Package Management. 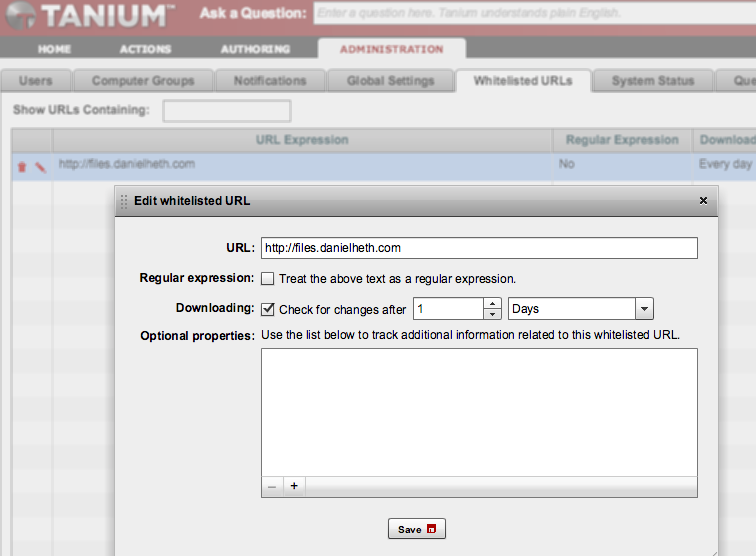 Visit https://community.tanium.com/repo/solution/192 and click the “Download” button after logging into the Tanium Community website. Log into your development infrastructures Tanium Console, then browse to Authoring->Import Content, select the downloaded XML file to complete the import process. It is safe to overwrite any existing sensors as the only one I am using that is not original content is the Operating System sensor. 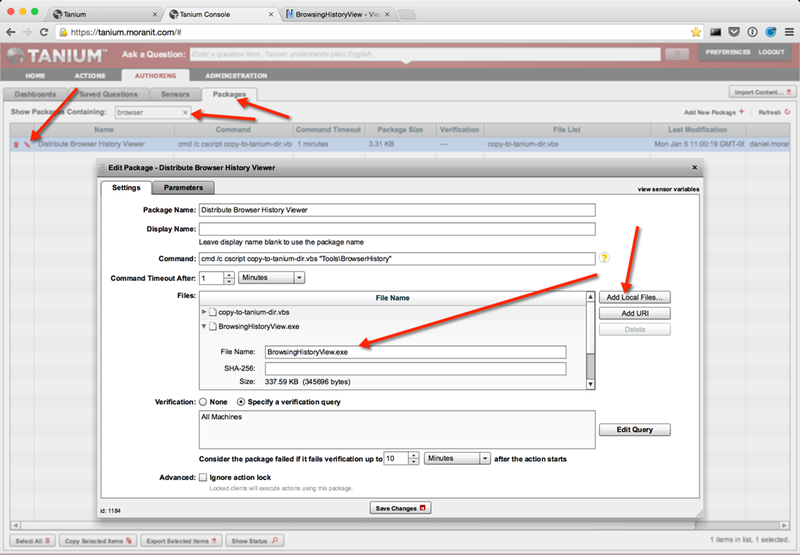 Now we move onto actually using this content and keeping the packages on your Ubuntu systems updated. On the “Home” tab of your Tanium Console, you’ll find a new dashboard link appear under the “Other Dashboards” block. 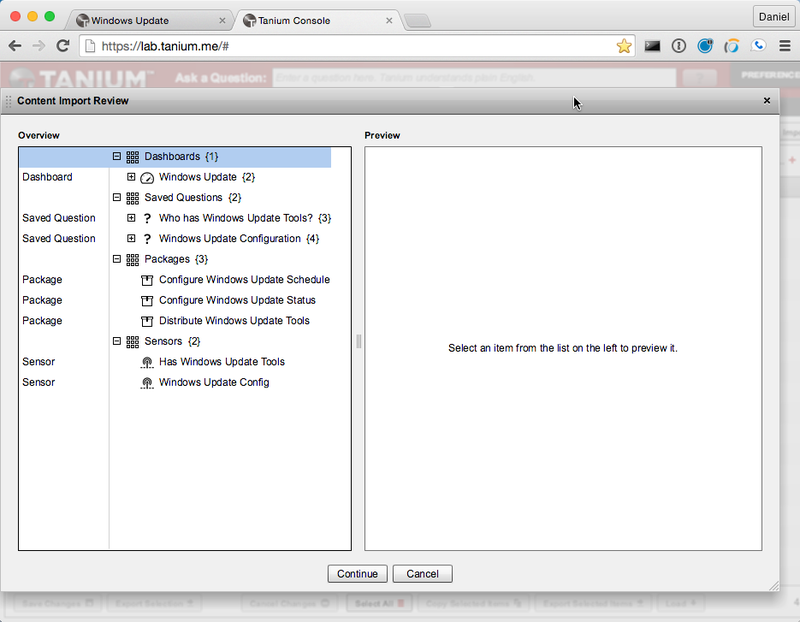 A few saved questions will appear… the left pane shows all packages within your environment that have available updates. The right pane will list all of the Ubuntu computers you have within your environment. There are currently two available packages/actions included with the solution pack. The first is accessible by right clicking on one or more of your Ubuntu systems in the right pane and the default action is Reboot Ubuntu Machine. The second action is closely tied to the Ubuntu Available Patches sensor as it takes the selected result of that sensor to launch the action. 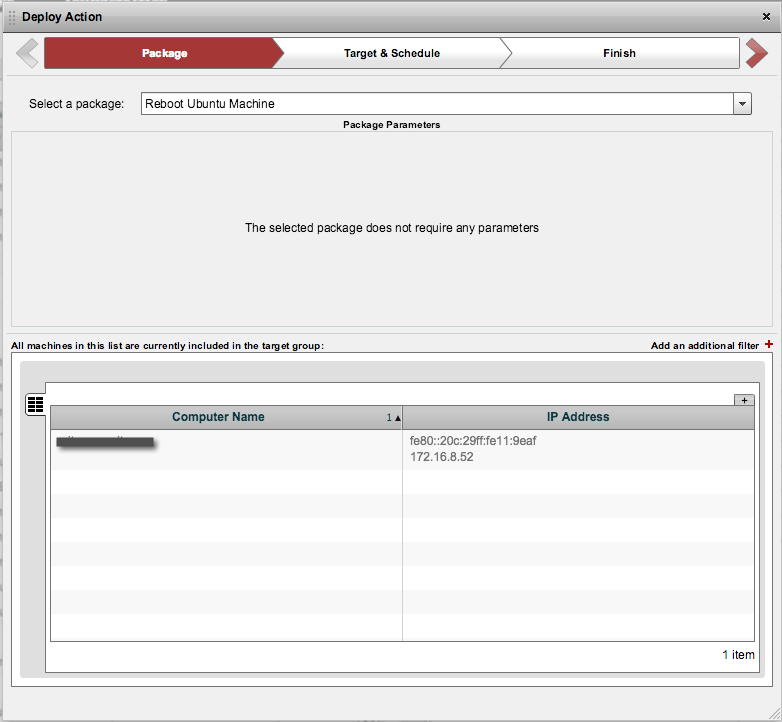 Thus in the left pane, right click on one of the packages and Upgrade Available Ubuntu Package. There are other handy actions you can take. Right clicking on one of the computers, you can drill down into the Ubuntu Available Patches and a list of packages for that one system will appear…Then you can deploy or upgrade a single package from there. Further right clicking on the computer provides you with the ability to Upgrade All Ubuntu Packages, if that is preferable. It uses the Is Ubuntu sensor which returns one of two answers for your entire infrastructure… True or False. Right click on the True and deploy the Update Ubuntu Package Definitions package. I would like this action to occur daily on all of my Ubuntu computers… thus I will be setting up a scheduled action. I have decided to have the action run between 4am and 5am daily so when I start working and want to check my package status, I have the latest data. Please note that the Action Group is “Ubuntu”. This is because I have setup an action group that only includes my Ubuntu systems that I’ve targeted with my “Ubuntu Computers” computer group. 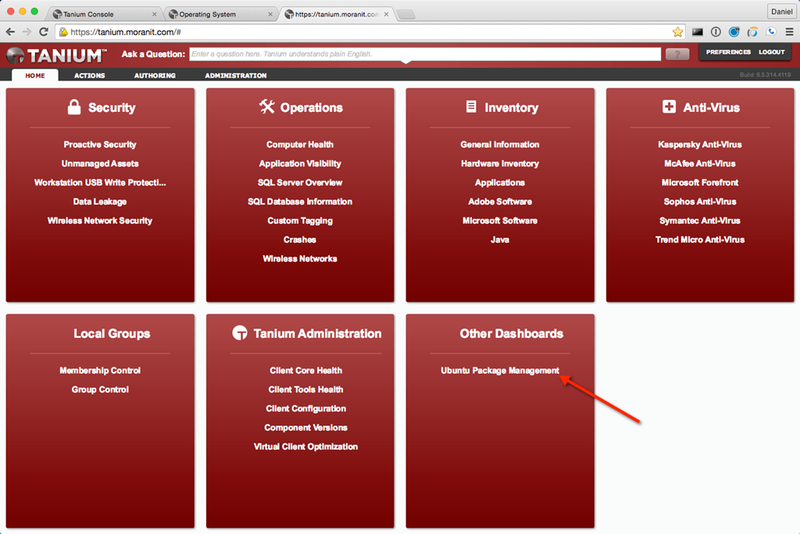 Using the Tanium platform to manage your enterprise is extremely easy. With a little bit of work and understanding you can put together a solution to accomplish nearly anything you want. 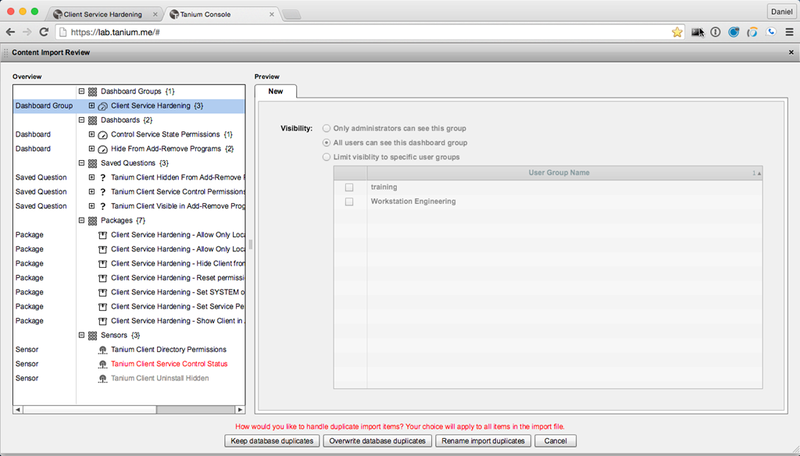 There are many awesome solution packs available for use on the Tanium platform. One of those solution packs is called Browser History. It takes advantage of an awesome little utility from NirSoft called, not surprisingly, BrowserHistoryView. It was written to read the history data of 4 different Web browsers like IE, Chrome, FF, and Safari. 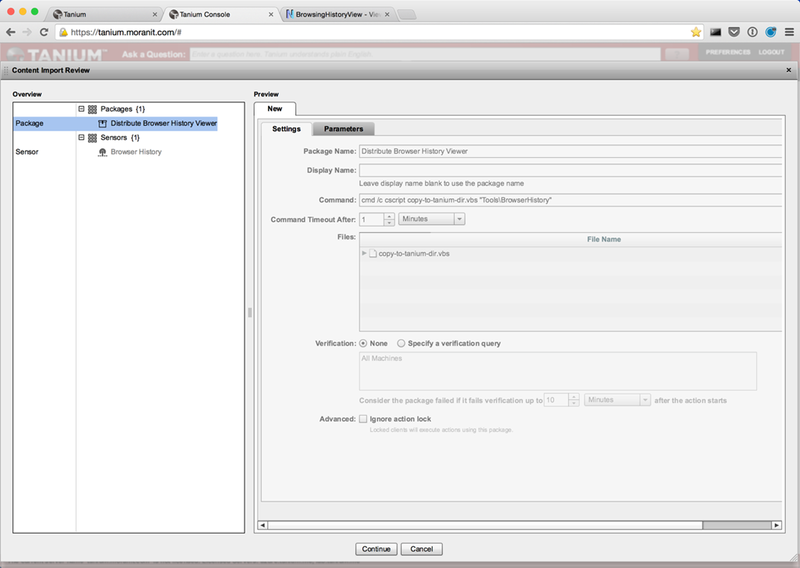 One of the talented engineers over at Tanium wrapped that utility up in content for use on the Tanium platform. I will go over the basics of setting up and using that content in this article. 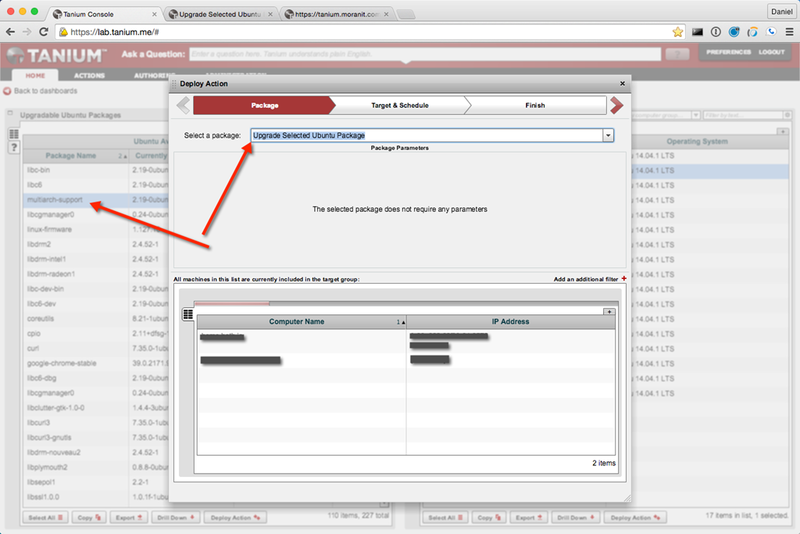 Everything with Tanium typically starts by importing content and the Browser History solution pack is no different. 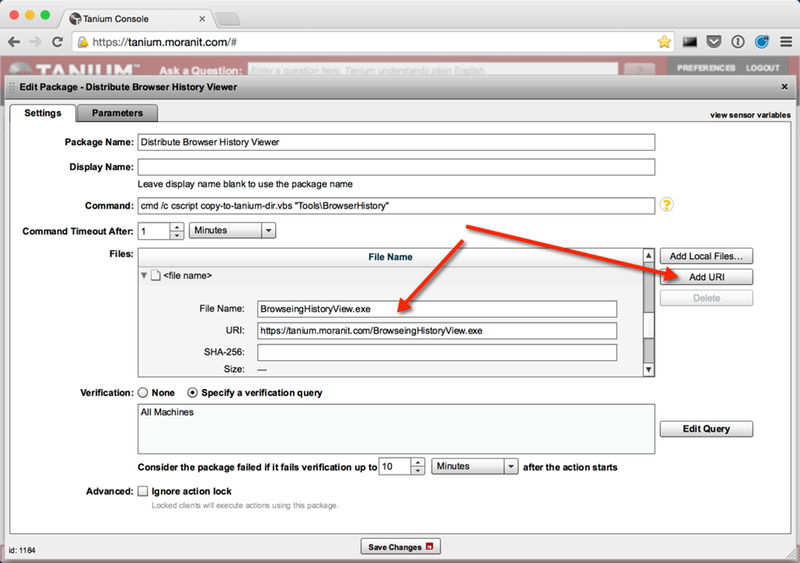 Ask your TAM or contact support@tanium.com if you do not have the BrowserHistory.xml solution pack file. Once you have that xml file, log into your console and browse to the Authoring tab and click the Import button, browse to the xml file and hit ok. Since this solution pack requires a 3rd party utility, you must acquire this utility by visiting the 3rd party vendors website. Browse to the very bottom and download the 32bit version. Now that you have the utility we need to modify the “Distribute Browser History Viewer” (https://community.tanium.com/repo/package/16) package. Click the “Add Local Files…” button and find the downloaded BrowsingHistoryView.exe and add it to the package. Place the BrowsingHistoryView.exe file into the following directory on the server. I am calling out the default installation path, but your’s may vary if you changed it during install. To follow my personal best-practice of distributing software with a Has-Sensor and a Distribute-Package, I have put together a “Has Browser History Utility” sensor (https://community.tanium.com/repo/sensor/789) that is downloadable directly from the community site. It is a basic sensor that simply checks the install folder and tells you whether or not the utility exists. 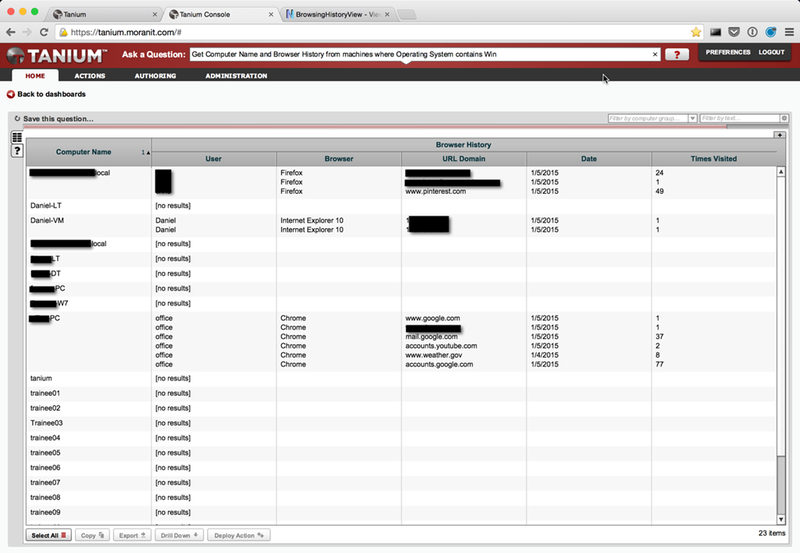 You can then schedule the “Distribute Browser History Viewer” package to all endpoints that report “No”. The answers you get back should be either Yes or No. If you have never distributed the package before, likely you will receive all No answers. Note: Unlike other articles, I have qualified the above Tanium Question by limiting endpoints answering the question to my Windows computers. I am using the Operating System sensor which is provided via the Initial Content solution pack.. This is to ease the work required on non-windows endpoints, but also since this particular utility only relates to Windows computers there is no need to involve my non-windows systems. I want to ensure the utility is there when I need it (when I ask for browser history), so I am going to reissue the action every hour. Only computers that report “No” will launch this scheduled action, thus once 100% of my computers receive the utility, it won’t run unless a brand new windows computer comes online. Now that we have this solution all setup it’s time to use it. The purpose of this solution is to retrieve the web browsing history of computers within my environment. Legal Notice: This is very sensitive data and you must use caution when asking for something you might not be authorized to receive. Pay particular attention to privacy laws in your country and the policies setup for your organization. I’ve redacted the personal information for my personal “organization”, however it does show you enough to know how the Browsing History Solution Pack works.